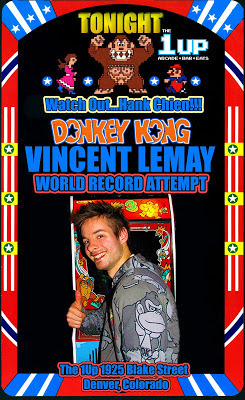 January 3rd, 2013 - Vincent Lemay is currently in the midst of a multi-day Donkey Kong world record attempt at The 1up barcade in Denver, Colorado. There wasn't much to see in today's action, and I mean that literally—a very blurry webcam made Lemay's gameplay nearly impossible to follow, but this issue will reportedly be resolved tomorrow. Alright, since I'm extremely tired right now, I'll stop Donkey Kong for the day (my sleeping schedule needs to be fixed today!). I'm still very happy with the game I did today: 850,600 (My pace was kindda 1.1m, slowing down a little bit throughout the game). My start was definitely bad (120k), and I had some few bad screwings, but it definitely means that the most important thing I'll have to work in order to beat the record is my pace, and maintaining my pace throughout the game... that's my biggest nemesis! I don't think I can pace higher than 1.14-1.15m with the style I'm playing... so I'll do my best to work on these elements of my game! I'll start streaming at around noon tomorrow, and hopefully do 2-3 real game attempts (I'll bring my own webcam this time, don't worry! haha). It's funny how it is relatively easy for Hank, Jeff and Dean to have a pace of 1.15m+. But for me, it's extremely hard, so I put this journey will help me to upgrade my pace! 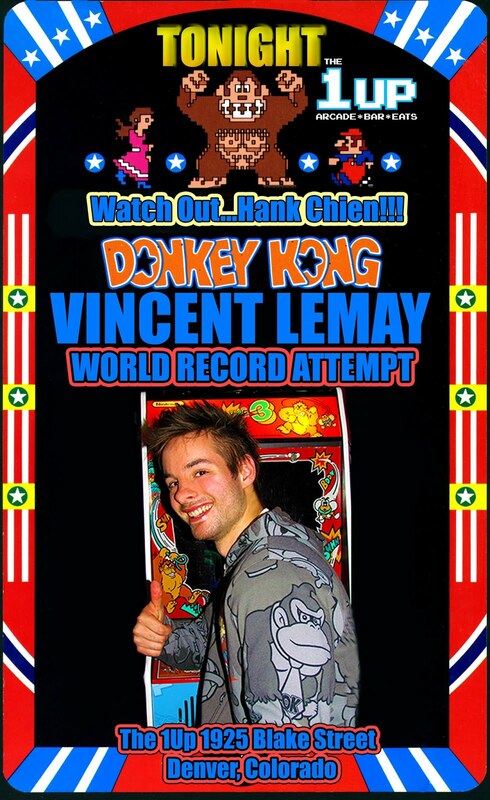 With the current world record standing at 1,138,600 points, nobody is holding their breath that Vincent will beat it while in Colorado this week, but it's well within the realm of possibility. After all, Lemay was less than 16,000 points away from 1.1 million in his big game last October. Everyone (even Hank!) is on Vincent's side and wishing him luck. The live stream will resume January 3rd at noon. 2,700 points away from the record. Too bad. I'm sure he'll get it before he goes back home.